Powder pink with a small subtle gold dot print, peep toe court. Leather lining and sole. Covered 75mm heel. A handbag is also available to accessorise your outfit. 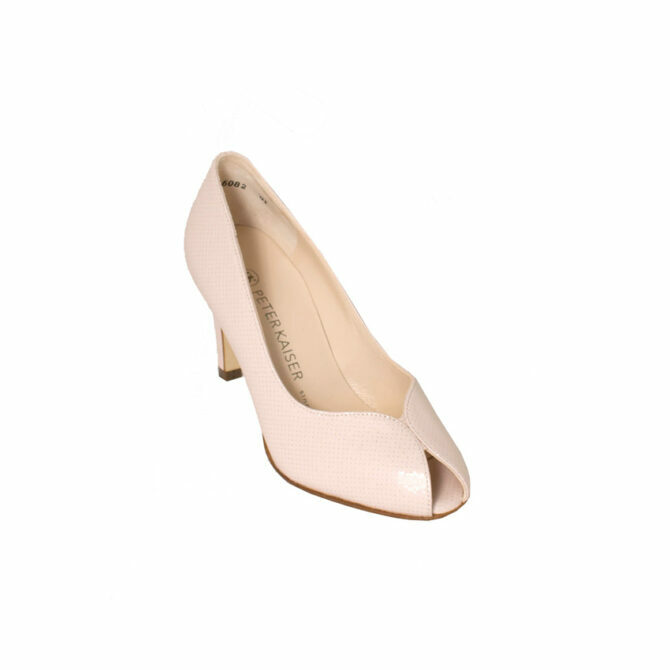 Powder pink with a small subtle gold dot print, peep toe court shoe. Leather lining and sole. Covered 75mm heel. A handbag is also available to accessorise your outfit. As a recognized designer of women’s footwear the brand has gained a cult following across the globe. Peter Kaiser shoes hold a reputation for channeling key fashion trends from season to season, from boots and shoes in winter, to classic sandals and slingbacks in the summer. Are these wedding shoes? Read our Wedding Shoes blog here. Established over 140 years ago, Bowhill & Elliott continue to design and make shoes and slippers for customers all over the world. As a recognized designer of women's footwear the brand has gained a cult following across the globe. Peter Kaiser shoes hold a reputation for channeling key fashion trends from season to season, from boots and shoes in winter, to classic sandals and slingbacks in the summer.